"Bauchspeck" is bacon used for cooking. The most common bacon on both sides of the Atlantic comes from the pork belly and is cured and smoked. 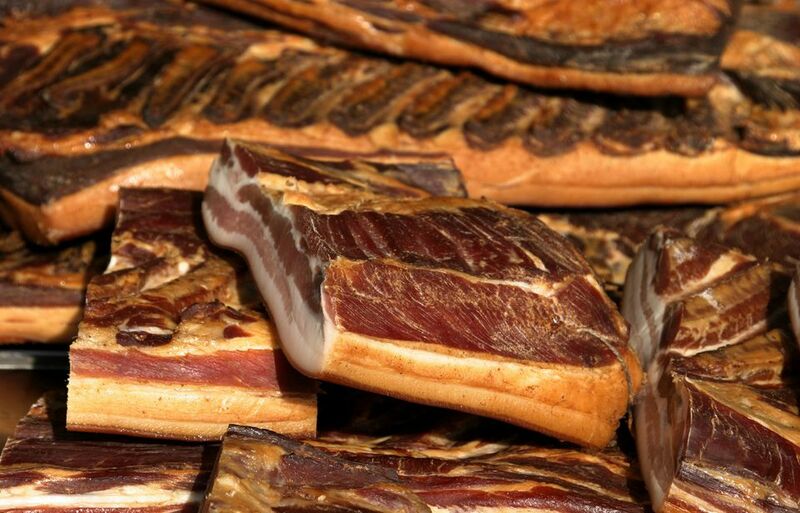 In Germany, it is cured with salt, then cold-smoked with beechwood (predominantly) and air dried. The wood determines much of the flavor, which is why hickory-smoked bacon made in the U.S. tastes different than the German "Speck." Also known as "durchwachsener Speck" or marbled bacon, it contains layers of meat and layers of fat. It is generally assumed that "Speck" or bacon comes smoked, but there is such a thing as "grüner Speck" which is uncured pork belly and can be cooked like other raw meat. Bauchspeck is usually sold in pieces which are then diced and browned in the pan (the "Schwarte" or rind is removed first). "Rückenspeck" - fatback. This white piece of pork fat is cut out of the back of the pig and is used, cured and smoked to bard lean foods, used in many sausages or is rendered fresh into lard or "Schmalz" (often eaten on bread). "Schinkenspeck" is a cured and smoked cut of pork from the back hip which is sliced thin and usually served as cold cuts. It has larger muscles and less marbling than the inexpensive "Speck" used for cooking. "Schinken" - a general term for all types of ham, the hind quarter of the pig. Hams can be fresh, cured, cooked or smoked. Not usually used to mean bacon. Where Can I Buy "Speck" or What Can I Use Instead of "Speck"? American Bacon - While there is a distinctive German taste that comes from beechwood smoked pork belly, the first substitution of choice is breakfast bacon from the supermarket. Try to pick bacon that is not labeled "honey" or "maple" because it is too sweet for most German dishes. Advantages: almost always available, salty, familiar. Drawbacks: the taste is not quite the same as the German product, it is pre-sliced which makes the dice a different shape and it is often mass produced and watery. Make Your Own Bauchspeck - If you are ambitious, smoke your own German bacon from a fresh side of pork. This takes several days to salt and a couple of hours to smoke but can be wrapped and frozen for future use. Smoked Pork Jowl - Found in the supermarket near the hams, Pork Jowl is fattier and dryer than the sliced bacon. Same advantages as bacon and makes a nice dice. Less expensive than sliced, breakfast bacon. Salt pork - Salt pork is not smoked, so the taste is distinctly different than "Speck" or bacon but can be used in its place. Your recipe will be slightly different, you just have to experiment. Pancetta - Italian cured, air-dried bacon (not smoked). This pork product has suddenly become popular in modern cooking recipes because a little bit goes a long way for flavor. It is not available in all supermarkets, our rural market does not carry any, for instance. See how to make your own pancetta. Proscuitto or "Parmaschinken" - salted and air-dried, no smoke is used. Very mild and popular in newer recipes. In Germany, we mostly used it sliced thinly for cold cut platters. Of course, if you want to try the real thing, there are a couple of ways to buy it. German delis in large cities often carry slabs of double smoked bacon from Schaller and Weber, German butchers in New York. Online delis will ship bacon as well.